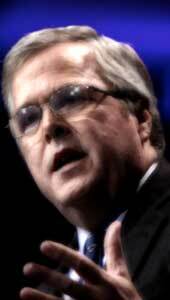 Why Does Jeb Bush Keep Touting His Failures? Jeb Bush, while very much a conservative, refuses to run as far to the right as possible to win the Republican nomination. This is rational. He knows winning the primaries with too much pandering means a likely loss in the general election. Instead, he is distinguishing himself from the pack by stressing his record from being a two-term governor. This would normally be rational, especially since he’s up against several Republicans with particularly thin records. But Jeb is developing an odd habit of breezily touting parts of his record that don’t look good up close. Liberty City is not an example of how charter schools can revolutionize education, but a cautionary tale of how not to fund our education system. But that claim has already proven to be a lot of mumbo-jumbo. Any politician that’s been around for a while is going to have hits and misses. But when you miss, you should learn from the mistake. Instead Jeb treats his misses like home runs. We’ve already had one President Bush who liked to say that up is down. Didn’t work out too well.